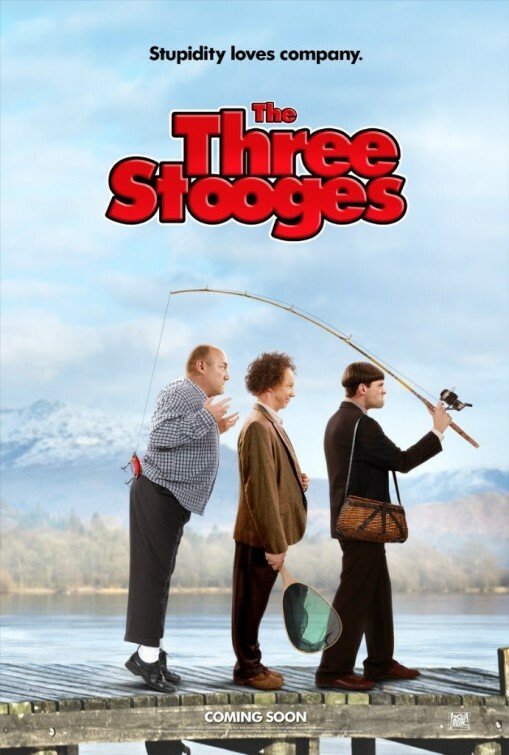 The Three Stooges movie trailer was enough to get my eight year old daughter and five year old son to quickly commit, but my ten year old daughter held fast in her refusal. I not only had a nostalgic desire to see the film, but I had just acquired two scapegoats to deflect blame in the event the movie was atrocious. There are undoubtedly fringe benefits for having common interests with your five and eight year old kids. Let’s just cut to the chase. The Three Stooges were never known as a mature ensemble trying to convey subtle dry humor. They perfected the art of slapstick, which as entertainment is timeless (but I guess that is debatable...just ask my wife). The question now becomes: what is the expectation level of such a remake. If your pretentiousness only allows you to see Oscar nominated films then I wouldn’t recommend this one. By the way, that was not why my ten year old daughter refused to go. She just thought it didn’t look good. You know “good” like iCarly, Jessie, and Good Luck Charlie. If, instead, you want to be entertained by idiots being idiotic then have at it. 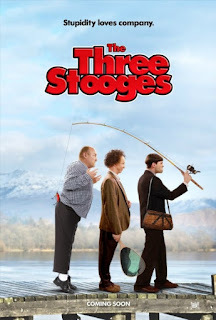 I really wanted to see how well the Stooges were portrayed and I was amazed at what a good job they all did (Sean Hayes, Chris Diamantopoulos, and Will Sasso). Sasso gets extra kudos for his spot on depiction of Curly. That is not to take away from the other two who were great as well, as the integrity of the characters remained intact. We the traditionalists take pleasure in that. I tried to stay tuned in to my kids during this movie. My five year old son was cracking up. I didn’t see much reaction from my eight year old daughter even though she claims to have liked the movie. I was doing my share of laughing too. Granted, it’s a limited sample size, but I came to a definitive conclusion based on our individual experiences. This type of humor is right in a five year old boy’s wheelhouse and will appeal to adult men of any age who have the maturity level and sense of humor of a five year old. Amen, brother. Now you know who I am! Unfortunately, I couldn’t enjoy this mindless humor as an innocent boy anymore, but it didn’t make it any less entertaining. I realized I was watching through the eyes of what has become a neurotic, worrisome man who isn’t what he once was (**ReelRhino note: he ain't kiddin'!). Every time I saw a chainsaw or sledgehammer taken to Curly’s head I was worried the moviemakers were going to be sued by some idiot kids who would try to mimic what they saw on the screen (funny, not worried about the idiot kids; worried about the lawsuit). In my head I found myself working out my fatherly post-movie speech on the subject of reality. Like an answer to a prayer, immediately after the movie ended two studly dudes faux posing as the Farrelly Brothers gave a safety disclaimer. Let me clarify. The answer to the prayer was the disclaimer itself, not the studly guys. They explained how the props were rubber and how it is never a good idea to poke anyone in the eye. Disaster averted; no obligatory lecture needed. Thanks, Farrelly Brothers, for cleaning up the loose ends even if it was most likely done at the insistence of your attorneys. Thanks Catfish, although you didn't touch on it, my real question is how does this fit in with the up and down career of The Farrelly Brothers. They have fallen from their 90's pedestal, but I think they still have the touch, but it is very hit and miss! I gave HALL PASS a 3 out of 5 Horn rating last year, and on a second viewing, I actually enjoyed it a great deal more, even perhaps as high as a 4 of 5! This movie was off the hizzy fo shizzy. That is one of the highest compliments I can pay a flick. This film was written and directed by Gareth Edwards and it was shot for a ridiculously reasonable $1.1 million in Indonesia. This film looks like a $30 or $40 million Hollywood flick, rather than the low budget indie that it is! 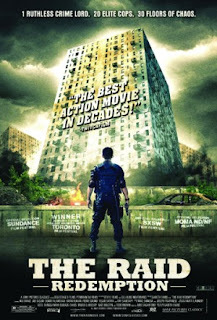 The story is simple: a police SWA T team is sent into a high rise building owned and run from top to bottom by the big crime boss in the Jakarta slums. Things go fairly smoothly, until they don't and that's when things get re-donk. This movie is about 70-30...70% crazy balls-to-the-wall action scenes consisting of some gun fights, but more prominently, hand-to-hand martial arts combat. These fights are crazy and there are some kill moves reminiscent of Mortal Kombat, but done in the real world. The speed and choreography is brilliant and again, Edwards is unreal in his shot selection and it all comes together in a tightly woven sequence of battles and fights, with sparse dramatic scenes interwoven, that for the type of movie are quite acceptable. This is a film that has been extremely hyped from a critical perspective. It is subtitled, which will turn some off, and most likely they can wait until it is re-released in the US after being remade here (which is unnecessary!). I had a great time watching this movie and I fully recommend seeing it in the theater, rather than waiting for the home viewing, and even more so watching it on a mobile device or a computer. 4.5 of 5 Horns for The Raid: Redemption....go ahead and take a try, it's an otherwise weak weekend ahead.